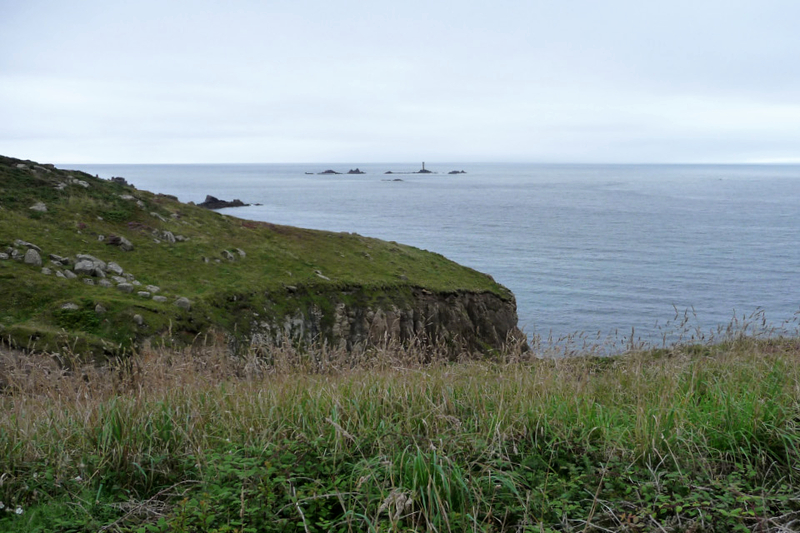 Land’s End. 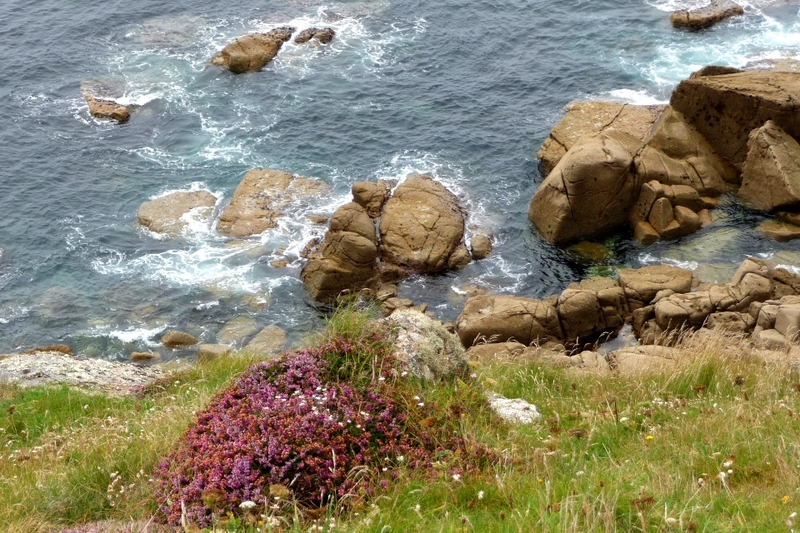 Enjoy pictures of the Cornish headland, the extreme westerly point of England’s mainland. 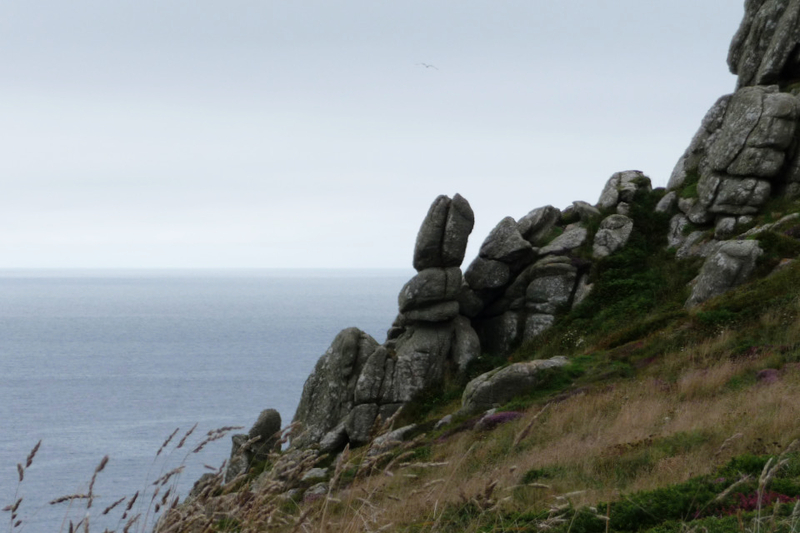 Posted in Uncategorized and tagged cornwall, land’s end. Bookmark the permalink. These radishes are looking fresh and delicious, don’t you think so? Would you like to take a bite? Posted in Uncategorized and tagged radish, Tone Finnanger. Bookmark the permalink. 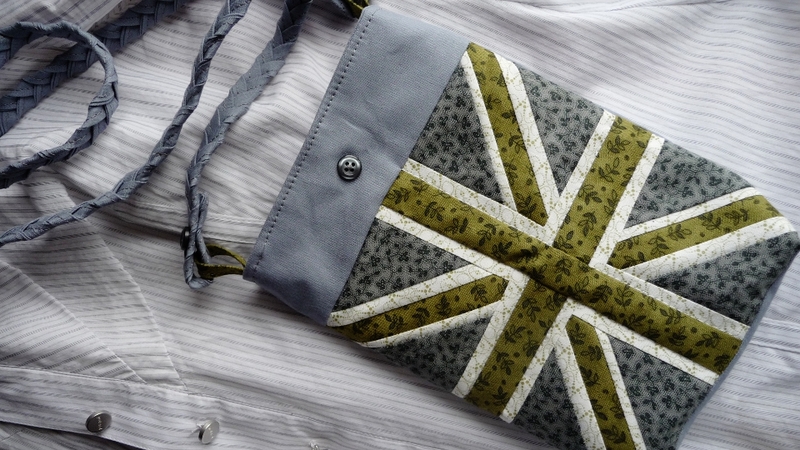 My paper pieced Union Jack turned into a purse after all. I had some doubts whether it would be too small to use it as a basis for a purse, and I did not want to add any borders. But after some consideration, I had the idea of adding a border at the top side only. I added a very small border strip at the bottom side, too, in order to not lose any part of the flag itself to the purse’s bottom. I wanted the back to look plain but not too plain. 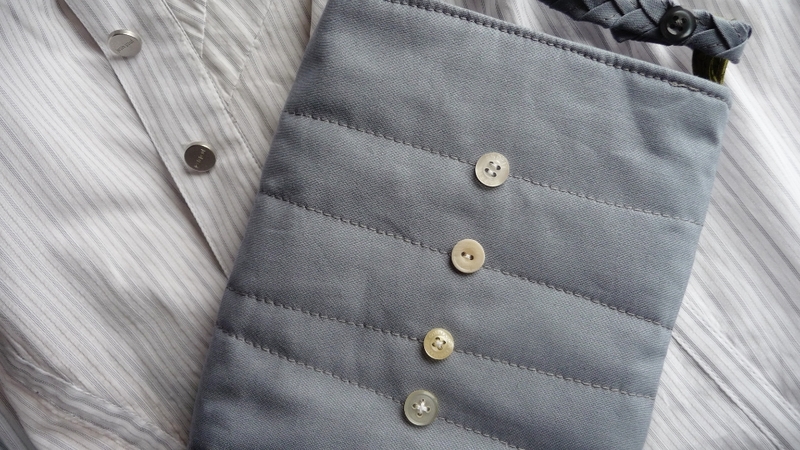 I machine quilted very little and added five buttons burrowed from some old shirts. I decided on sewing two loops to the purse’s sides in order to be able to vary the straps in future. Though chances are low that I am ever going to change them … now that I made this fabulous braided strap. It is durable, yet not too stiff and comfortable to wear. The purse holds my money, tissues, keys and one or two cough sweets. 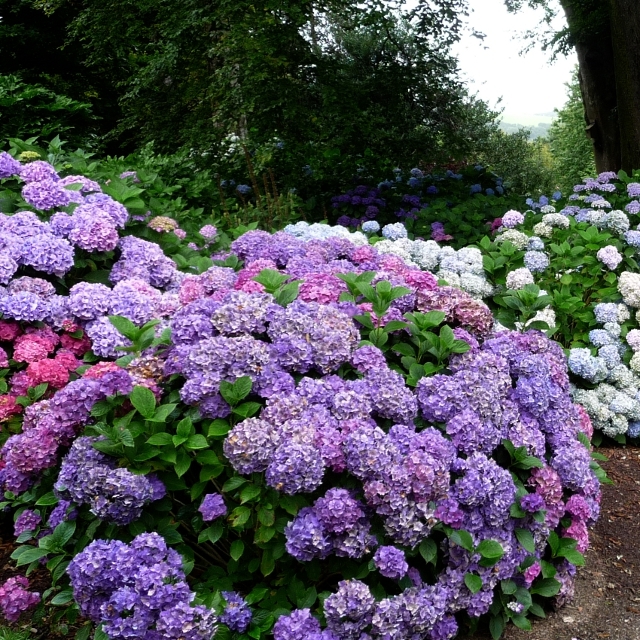 More than enough to go anywhere, isn’t it? 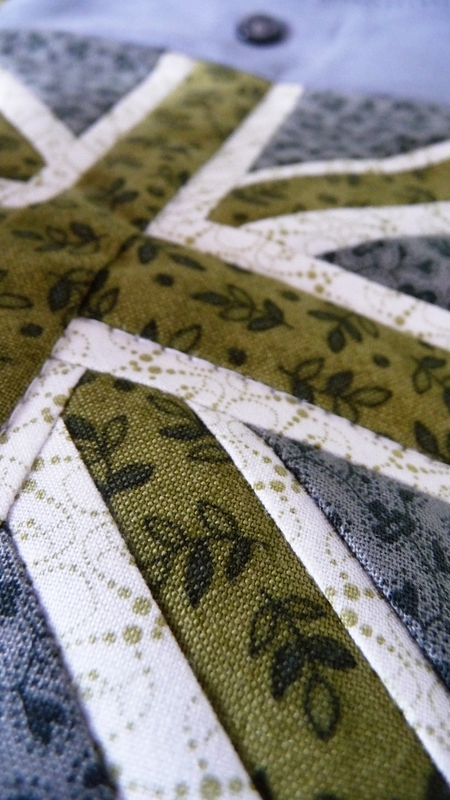 Posted in Uncategorized and tagged braided fabric, fabric braids, purse, shirt button, Union Jack. Bookmark the permalink. 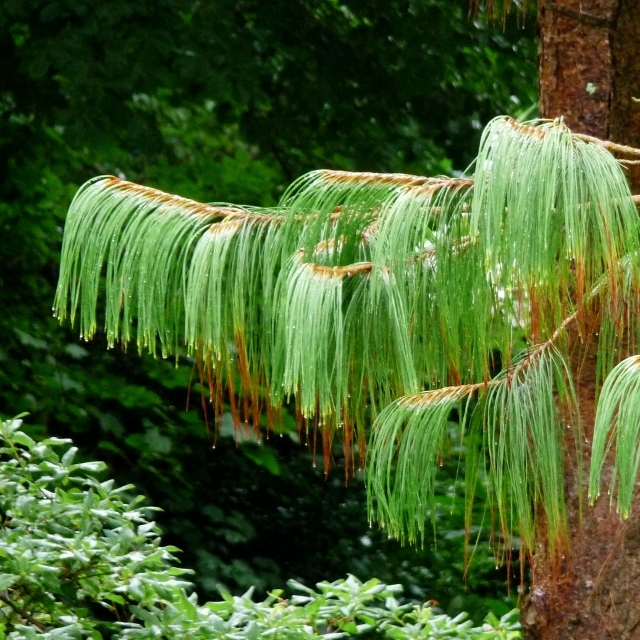 Today is garden nostalgia. 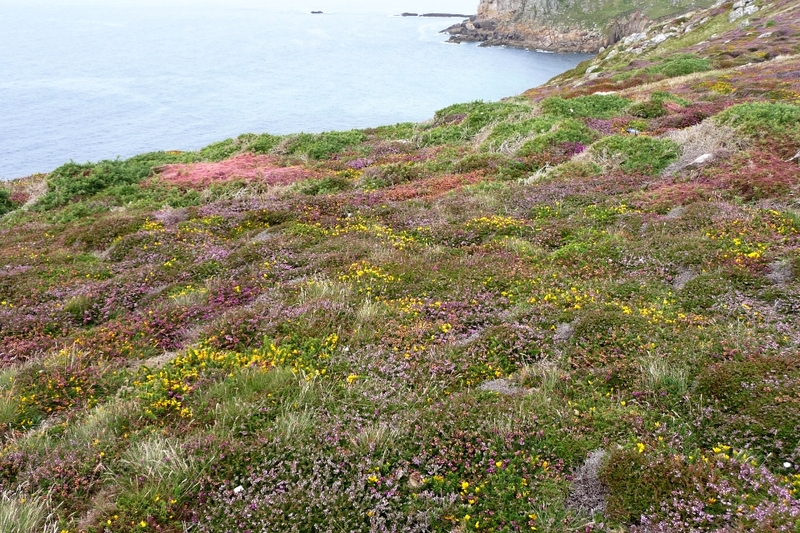 How I long for this August abundance. 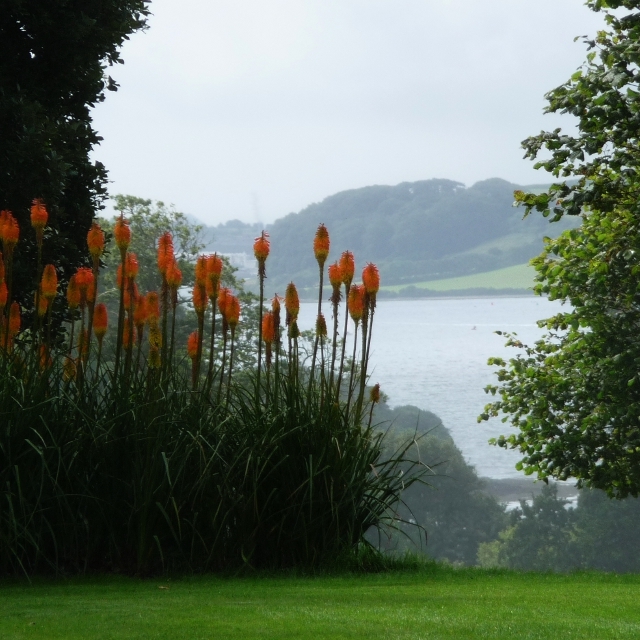 Trelissick Garden in Feock, Cornwall. 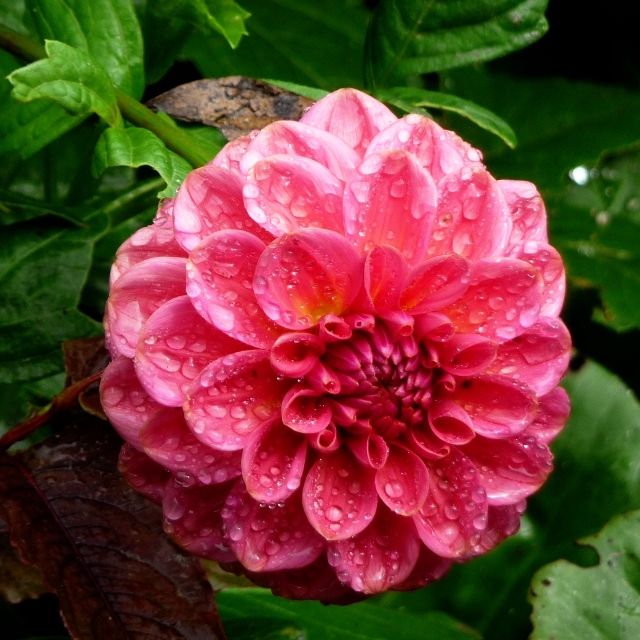 Posted in Uncategorized and tagged abundance, cornwall, dahlia, england, hydrangea, nostalgia, pine-tree, Trelissick Garden. Bookmark the permalink. 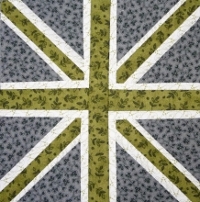 With this Union Jack I can display my love for everything British—whenever I feel like doing so. Originally, I planned it as a purse, but now it appears to be almost too small. I don’t know yet what to make of it. 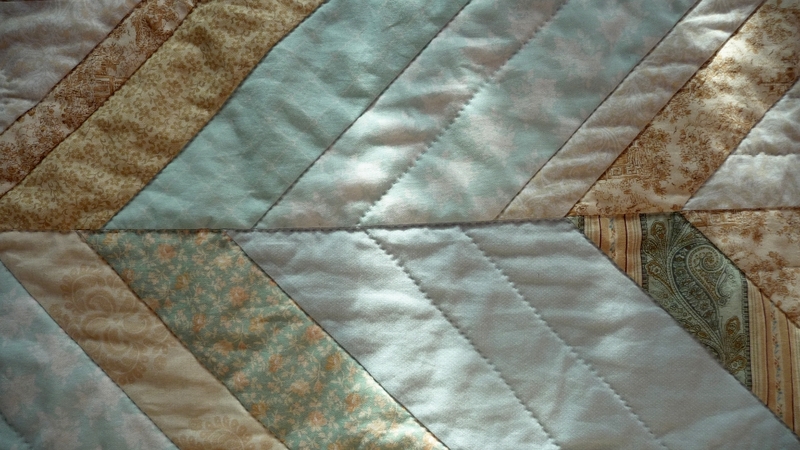 The four quarters around the middle cross were done in paper piecing. I like paper piecing except for the huge amount of discard fabric. 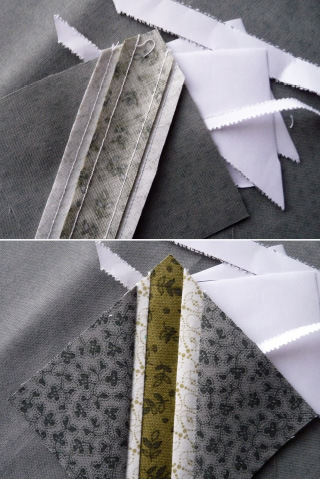 Since all pieces are pre-cut in their rough shape, you end up with much more waste fabric than when cutting the pieces to their real measurements. 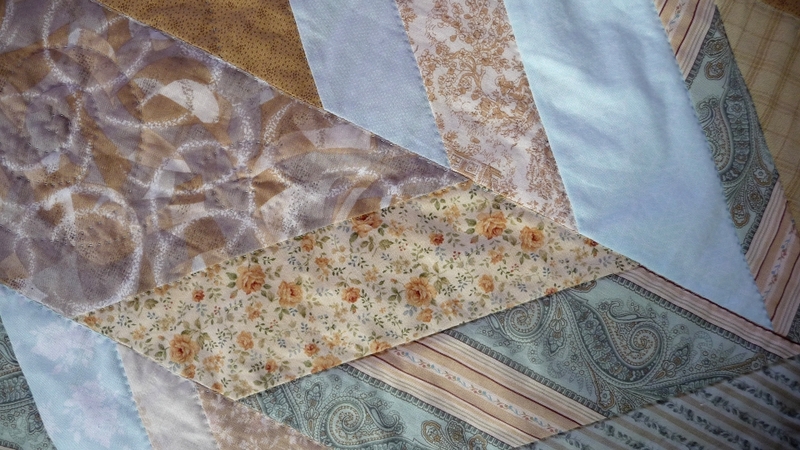 Nevertheless, small patchwork designs are much more accurate when they are paper pieced. And as the white strips of the flag are very thin indeed (less than 1/4 inch) I went for paper piecing them. 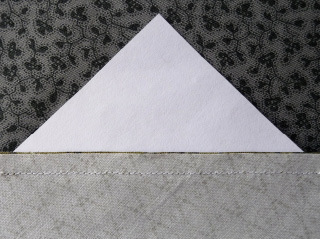 At first, I sew on the printed lines of the paper without thread. 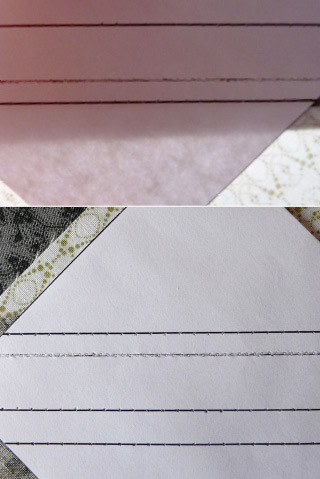 The perforation allows me to see the lines now on both sides of the paper, and it helps tearing the paper away after sewing. 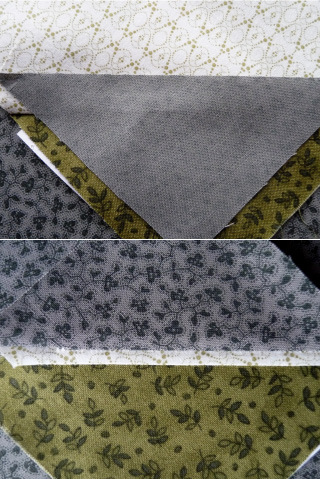 I place the first piece of fabric (here: green) on the paper, right side up, making sure that there is enough fabric overlapping the lines as a seam allowance. Then I place the second fabric (here: white) on the first, right side down. I make sure that the white fabric—after sewing and ironing—will cover the part for which it is destined. Before sewing, however, I hold the fabric-fabric-paper-sandwich up to the light so that I can see through all three layers and check if all the pieces are in place. 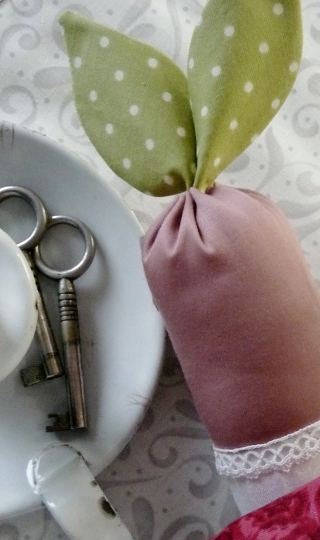 I turn the sandwich paper up, and sew on the printed line. At the beginning and end, I backstitch two stitches to secure the seam. 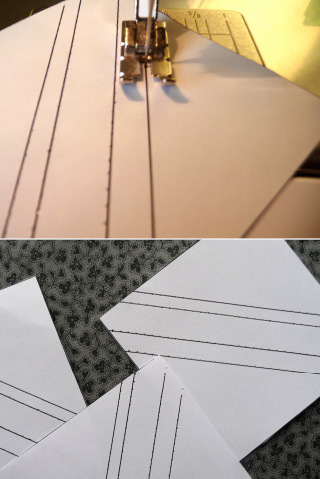 This will help to avoid ripping the seams when removing the paper later. After sewing, I cut the seam allowance to 1/4 inch. 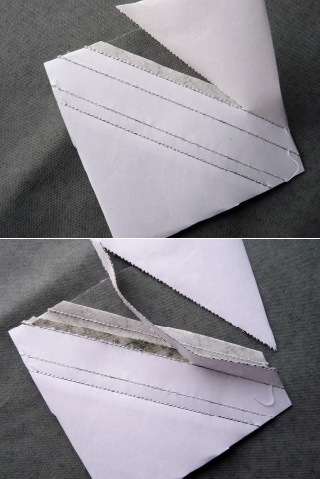 To make sure that I do not cut the paper, I fold it back. Then I fold it in place again and press the fabric open, right sides up. 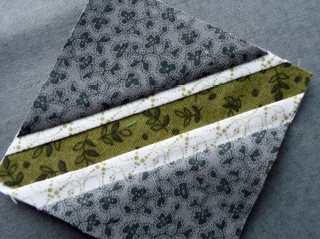 I continue with a third piece of fabric (here: grey). 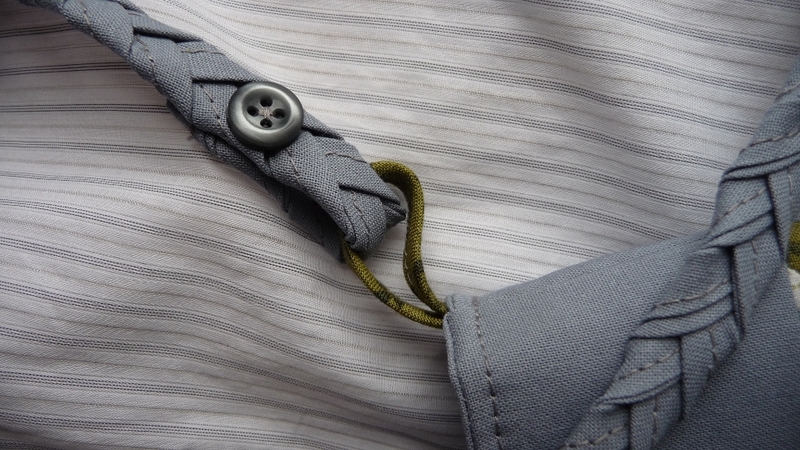 Then, on the other side of the green fabric, again a white strip, and then grey again. After everything is sewed, and pressed, I trim the excess fabric from around my paper template. Lastly, I carefully tear away the paper, starting with the large pieces and working my way to the tiny and narrow ones. 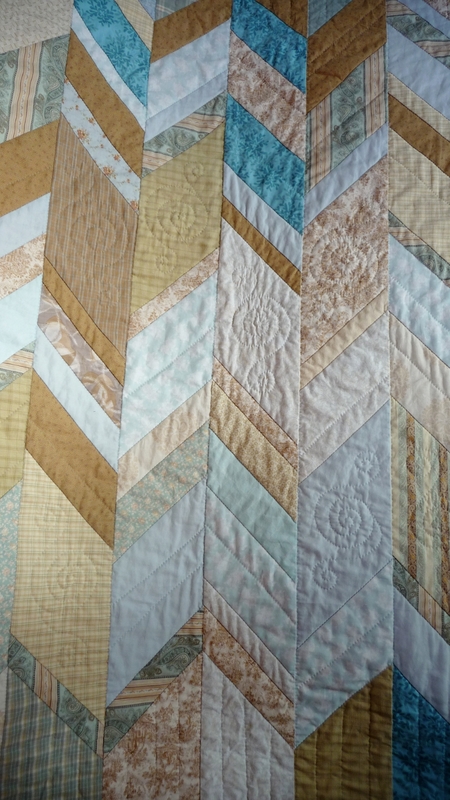 As soon as the paper is off, you cannot make out at all that this block was paper pieced, whether you look at the back, or the front. The rest of the flag, I did in “normal” piecing method: white strips on two sides each, and finally the green cross in the middle. 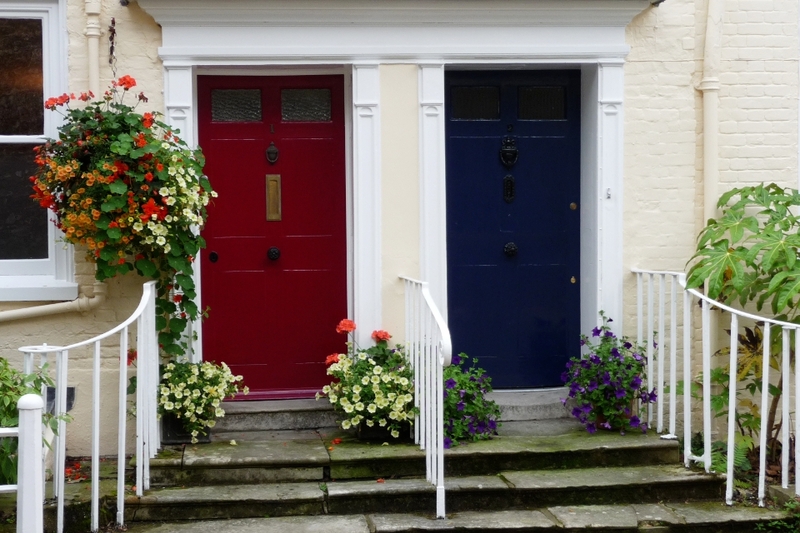 As you can see, I did not make a true British flag, neither in colour, nor in width-to-height ratio. My Union Jack is squarish because “it’s hip to be square”. 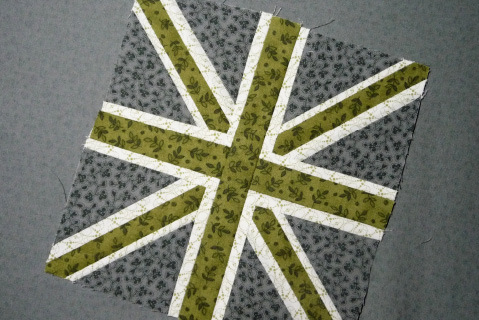 Posted in Uncategorized and tagged paper piecing, paper piecing tutorial, tutorial, Union Jack. Bookmark the permalink. This one, I finished some time ago already, but it was only today that we both found the time to do a photo shooting. Seaside Cotillion was the first quilt kit I ever bought, and there was so much fabric left over that I could not help but do another quilt in the same colour range. I had to roughly double the fabric amount to get this throw. Some were added from my stash, and I found the rest in my local quilt shop. The pattern seems to be very simple, yet I find as much to look at as in any other quilt. Quite strange. The design is by Joel Dewberry. 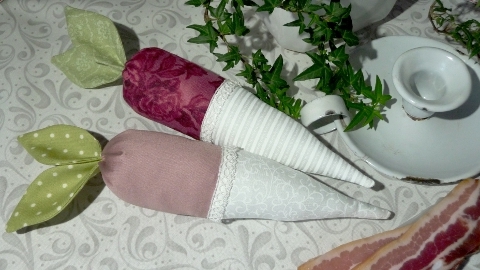 Since I changed the size, I could not stick to the pattern too closely. The math, I remember, took me quite a while. 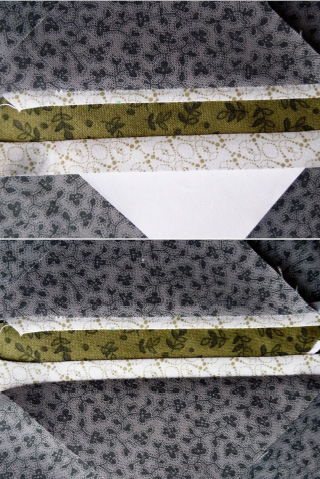 Every pieced strip had to be the same length, and, as you might make out in the last picture, though the diagonal seams do but rarely meet, they had to meet at both ends, as they did in Joel’s version “Spring Song”. 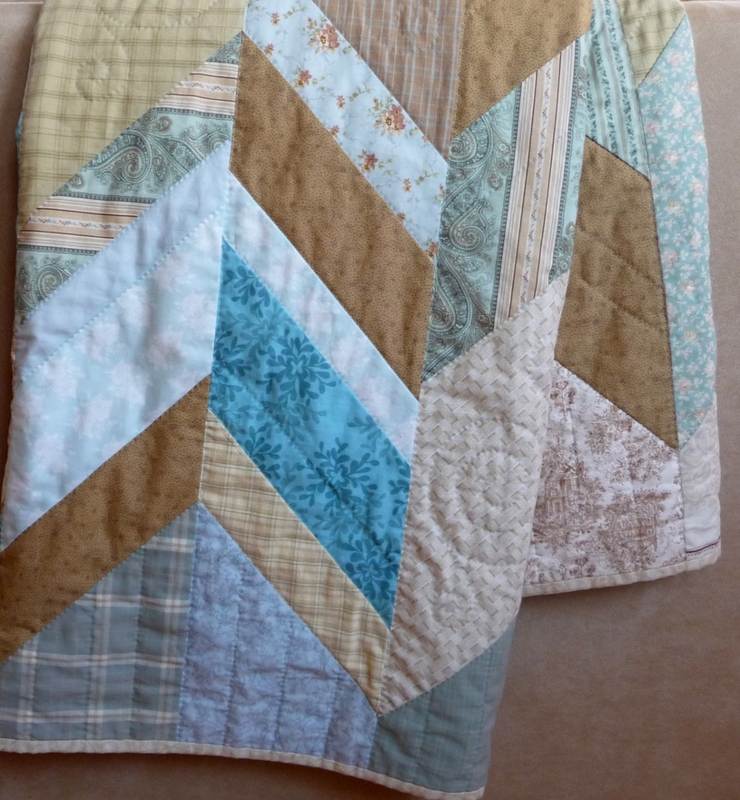 Posted in Uncategorized and tagged Joel Dewberry, lap size quilt, modern quilt pattern, quilt kit, Seaside Cotillion, Spring Song. Bookmark the permalink. 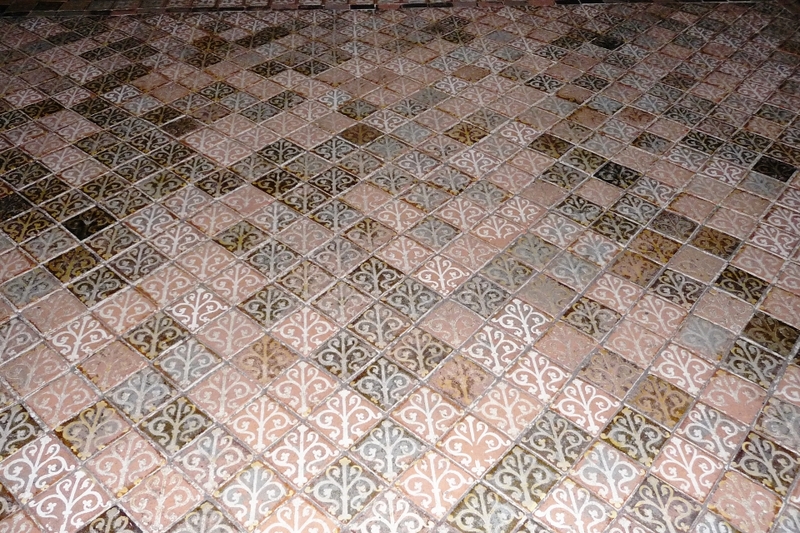 I still remember treading those tiles very well. How I like them! They look exactly like a quilt come to stone—or ceramic. While most visitors craned their necks to look up and up at the columns and archs of Winchester Cathedral, I had my nose on the floor, trying to get a picture without Japanese feet in flip-flops. 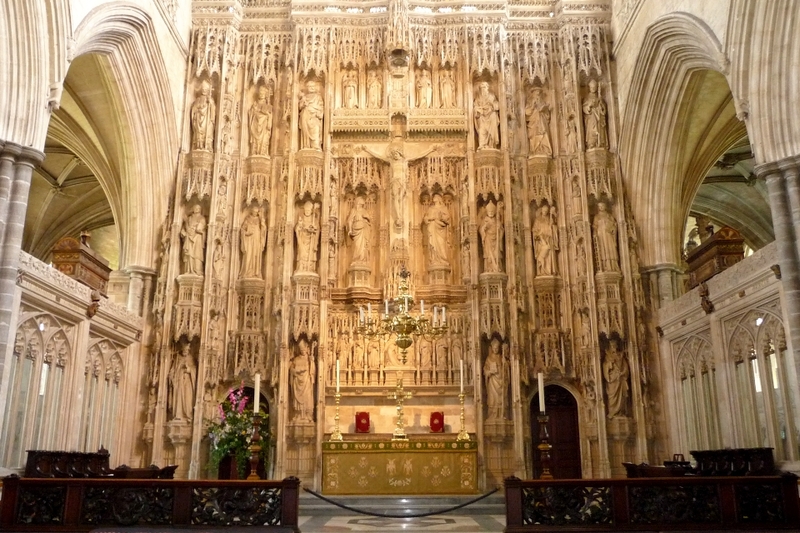 Posted in Uncategorized and tagged england, nostalgia, tiled floor, winchester, winchester cathedral. Bookmark the permalink.